Preheat oven to 400 degrees F (200 degrees C). Line a 7-inch round baking dish with parchment paper. Beat 1 cup raw sugar and 1/2 cup butter together in a bowl using an electric mixer until smooth and creamy; beat in eggs, 1 at a time, beating well before adding the next egg. Stir flour, water, and lemon zest into creamed butter mixture until batter is smooth. Pour batter into the prepared baking dish. Bake in the preheated oven until top of cake springs back when touched, about 30 minutes. Cool cake completely. Beat confectioners’ sugar, 2 tablespoons butter, and lemon juice together in a bowl using an electric mixer until topping is smooth and creamy. Mix 3 1/2 tablespoons raw sugar and remaining lemon juice together in a separate bowl to make the filling. Slice the cooled cake horizontally, forming 2 round cakes. 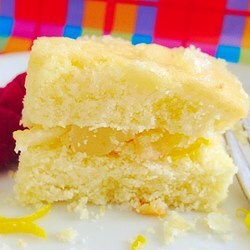 Poke holes into the bottom cake and pour lemon-sugar filling over cake. Place second cake over the bottom cake and spread the topping over the top cake. Your recipe for the weekend…do enjoy! !